Osteoarthritis of the hip is a very common condition. Total Hip Replacement (THR) is a successful operation to relieve pain and stiffness associated with arthritis, and has been named one of the most beneficial procedures in medicine. In 2015, just over 98,000 hip replacements were performed in UK. 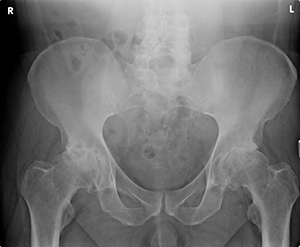 A diagnosis of hip arthritis is made following a thorough history, examination and usually an Xray. Patients with arthritis of the hip often complain of groin pain when walking or twisting around. The pain may radiate down the front of the thigh to the knee, or may only be felt in the thigh and knee. Alternatively, pain maybe felt over the side of the hip or in the buttock. Examination is important to differentiate pain arising from the hip, from pain arising from the back, or knee for example. Examination may reveal a leg that is slightly short due to loss of cartilage, have a restricted range of motion that is uncomfortable, and patients tend to have a limp. The diagnosis is usually apparent on XRay, but an MRI scan may be required in early cases of the disease. Management of osteoarthritis in the hip, follows general management principles for OA – namely non-operative options of weight loss where possible, analgesia and anti-inflammatory medications, exercise and possibly intra-articular injections. Intra-articular injections may be particularly helpful in early OA, or when it is difficult to identify whether most pain is coming from the hip, or from the back. The injection includes a local anaesthetic and a steroid and can help alleviate symptoms for a number of months. The injection can be performed under an anaesthetic in theatre, or in the radiology departemnt using local anaesthetic to the skin and tissues. Walking sticks are a very useful adjunct to reduce pain in hip arthritis, and should be used in the opposite hand to the side of the hip with arthritis. If a decision is made with you to perform a hip replacement, a convenient date will be arranged. The operation is performed to remove the worn arthritic joint and replace the ball-and-socket with an artificial implant. An incision is made over the side of the hip. Mr Flynn generally utilises a posterior approach to the hip, to preserve as many muscles as possible, and therefore reduce the risk of any limping after the THR. In essence, a stem is inserted into the thigh bone, and a cup is placed in the pelvis. A ball is placed onto the stem to articulate with the new cup. The implants maybe held in place with cement around the implant, or via a press-fit (uncemented) technique. The choice of which technique is used depends on a number of factors including shape of anatomy, bone quality or thickness, and any deformities that maybe present. The bearing surfaces of the joint maybe metal-on-plastic, ceramic-on-plastic, or ceramic-on-ceramic. Metal-on-metal bearings are not used due to concerns regarding their outcomes. Total Hip Replacement is one of the most successful procedures in medical history. It relieves pain and stiffness in a reproducible way. The cemented implant used by Mr Flynn is the most common implant – the Exeter hip replacement, with survival of 97% at 10 years in the 2015 National Joint Registry. The uncemented implants ( Trident –Accolade ) is also one of the commonest uncemented implants used and has survival rates of 96.5% at 7 years in the 2015 NJR. Infection An infection after a joint replacement is a serious complication. Antibiotics are given around the time of the operation to reduce the risk, but do not abolish the risk completely. Meticulous technique and care throughout the operation help reduce the risk. Any suspected infection should be investigated quickly and may require surgery to washout the joint, and longer term antibiotics maybe needed. Loosening Over time an implant can loosen from the cement , or from the bone. In the long term this is the more common risk, and is termed ‘an implant working loose’. If this were to occur a revision of the hip replacement maybe required. Dislocation In a THR, the ball and socket is placed in a position to give as much stability as possible. However, the ball can dislocate from the socket if placed in extremes of position. Guidance will be given as to how to avoid dislocation, but this is a lifetime risk whilst the hip replacement is in place. 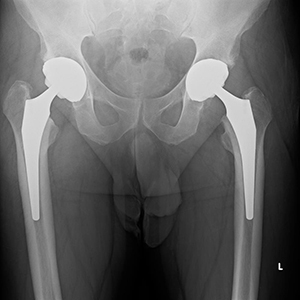 Fracture A fracture is a rare complication but can occur during surgery, whilst implanting the hip replacement, or after surgery around the implants following a fall or severe twist. Leg length discrepancy During surgery every effort is made to correct any shortening of the arthritic leg, and restore the leg length to normality. A difference of a few millimetres is not usually detectable, and minor differences can be accommodated with small heel inserts in shoes. DVT / PE ( Deep vein Thrombosis / Pulmonary Embolus) Blood clots are a risk after any joint replacement, and injections are given around the time of surgery to reduce this risk. Oral tablets are then taken for around 28 days after the operation, and compressive stockings worn for 6 weeks. Persisting discomfort Following a hip replacement some discomfort can persist. This is usually related to the soft tissues ( ligaments, tendons and muscles) around the hip, and will usually improve with time. Any longer term pain or discomfort will be investigated to establish the cause. Mortality The 90 day risk of death following a THR is related to age. The overall risk in the National Joint Registry 2015 is 0.16% if < 55y.o, and 3.1% over the age of 85y.o. A THR is performed under GA, or with a Spinal anaesthetic and sedation. The best option for any individual is discussed with the anaesthetist prior to surgery. Once the decision to proceed with a THR is made, a pre-operative assessment is conducted to review medications, general health conditions, and measure weight and blood pressure. Patients are admitted on the day of surgery. In-patient stay is usually 2- 3 nights. The procedure takes 60 -90 minutes, and the anaesthetic time is usually around 2 hours. The scar is over the side of the hip and is approx. 7-8 inches long (18-20 cm). The scar will fade with time, and it is very useful to massage the scar with creams or oils once it is healed. Clips are removed from the wound at 10 days post-operatively and the wound checked. Driving is usually allowed at 4-6 weeks after a hip replacement. Crutches are normally used for around 6 weeks, depending on muscle strength and walking ability.